This idea of doing something like this has been in my head for quite some time after seeing these on Anne's blog. Finally I got it done and there are some regrets to it. I think my filling needs some changes. It's tender, but a bit too tender for me, it doesn't fall apart, but.. then.. maybe I should just skip the egg, give the mince more workout, because I used frozen mince, which tends to be softer than fresh. But it was well received by my kids and Lydia could eat up one large roll herself and asking for more, LOL. I used scallop broth for this, but really you can use any broth you like, Bilis broth, chicken broth... just anything that you think you will enjoy drinking later. But personally I think seafood based broth will be a better choice to complement the pork filling. 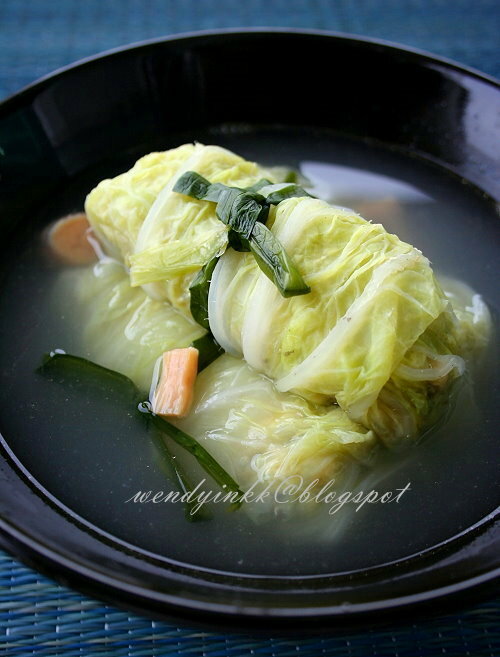 Since Chinese New Year is here, why not use Abalone broth for a bit indulgence. LOL. 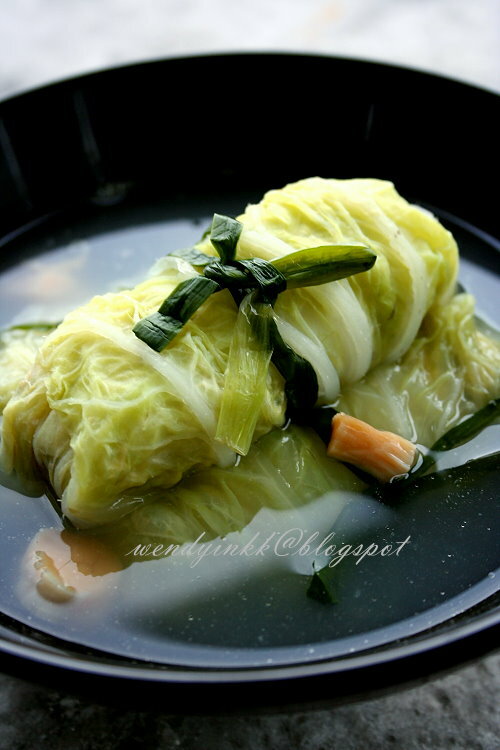 8 to 10 pieces of Chinese cabbage leaves. 1. 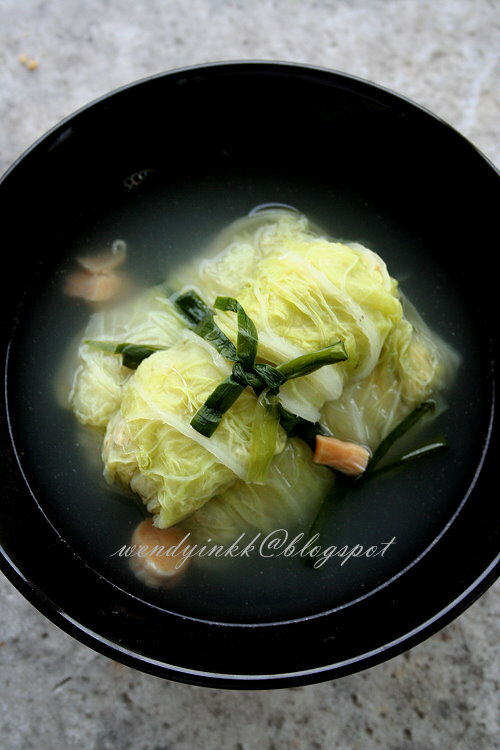 Boil a pot of water and blanch Chinese cabbage leaves until soft. It takes about 30 seconds. Dunk them into tap water to cool off. Blanch Chinese chives and dunk in tap water to cool off. Drain both in a colander. 2. Combine pork, shrimp, salt, cornstarch and egg. Give it a thorough mix. 3. 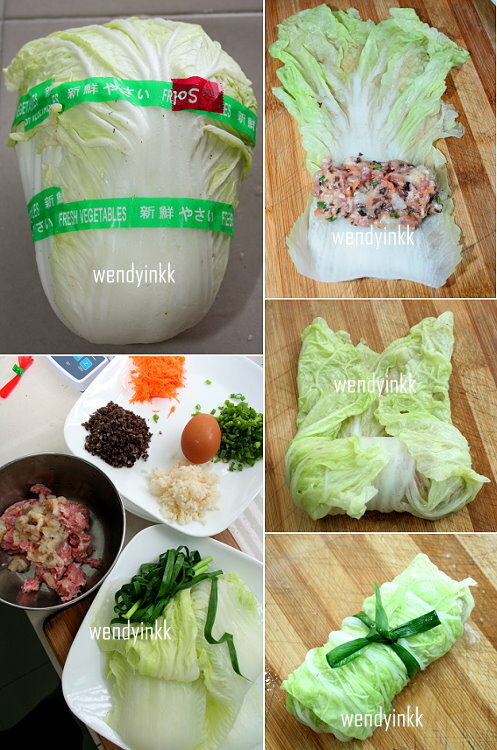 Put the minced vegetables into the meat mixture. Mix to combine. 4. Place one piece of cabbage onto cutting board. Spread it apart. Place in heaped Tbsp of filling in the middle of the white part. Roll up and tuck in the sides and complete the rolling. Secure the roll with a piece of Chinese chive. 5. Place rolls in a pot. Pour in just enough broth to cover the rolls. Bring to a boil on medium heat. When it has boiled, pour in the remaining broth and let it come back to a full boil on medium heat, lower to a simmer for 10-15 minutes. I love it too.....done in a unique presentation! Your guests must be impressed to indulge this in. Very nice, I like, I like! Nice Wendy! Very elegant dish! This looks so pretty, like a jade parcel. No frying and cleaning. Easy to prepare and yet tasty! Love your presentation. Hi Wendy, made these during a CNY gathering! well loved dish! mine didnt look as good though:P chives strings didnt work out so i just let it be..haha.thanks again!